I’ve yet to find a Wesley Simpson scarf, but I’m always delighted to see “new” ones that are unearthed from the used clothing venues of America. It made me really happy that art and vintage clothing lover Monica Murgia recently found an especially peachy one. Yay! Me, too! I will be on the lookout for one for you. 🙂 I had a reader contact me. She has two – I asked for pictures . . . .
HI MONICA,WHERE CAN I FIND A CATALOGE OF WESLEY SIMPSONS SCARFS,MY MOTHER GAVE ME ONE A LONG TIME AGO AND IM TRYING TO FIND INFO ON IT. i have one ! do you want it? Lovely post and great advert, thank you for posting it. I’ve been lucky enough to lay my hands on a couple – the Dali Ballerina and that top right ‘toile’ one (mine is purple, but it also seems to exist in navy). And funnily enough, I was one of the bidders on that lovely ‘Monica Murgia’ one a fortnight ago. Sadly funds are low at the moment and I didn’t want to go high, otherwise it might have been mine! They do seem to come up very occasionally, although I wonder how many are still about. The silk is quite thin and fragile and many may have struggled to survive. Someone who had a ‘Ballerina’ told me theirs had suffered colour runs. As a result although both mine need cleaning, I’m rather reluctant to do anything about it until I’m sure I can find an expert who will know how to handle them! The ballerina is lovely! Be careful with cleaning. Make sure they are a textile conservator – try AIC’s website to find recommendations. Thank you, Monica. I’m actually in the UK and was wondering about contacting the V&A to ask them who they use to clean their fragile textiles. In the meantime, I keep them carefully stored! The scarf at the top right of the ad is the one that the Metropolitan Museum of Art has in their collection! You should send them a a link to the ad. They would be thrilled to have it for their archives. I recently got the Day & Night scarf. Mine is purple, not blue. Just wondering if you have any additional information on either artist or the company. Thanks so much! 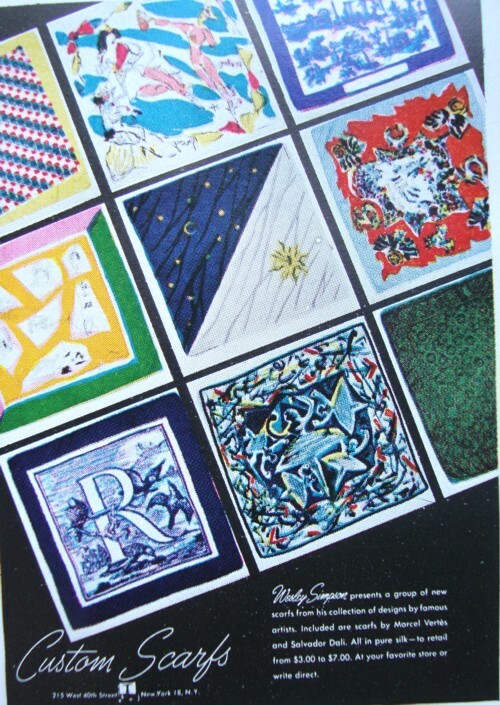 Hi trying to find more information about a scarf I have labeled “It’s in the cards” by Wesley Simpson Any suggestion where I can look for information?